A relic of St Pio of Pietrelcina, more famously known as Padre Pio, is returning to Rathangan, not far from Offaly's border with Kildare, later this month. St Pio’s glove will be in the home of Betty Malone, Shindella, Rathangan, located on the Rathangan to Monasterevin road on Sunday, April 29, 2018, from 11am to 5pm. Betty regularly hosts visits from the famous relic, and crowds flock to her home to see the glove worn by the saint. The Italian friar, who was born in 1887, was famous for exhibiting stigmata, or bleeding wounds, from his hands and feet during his life. 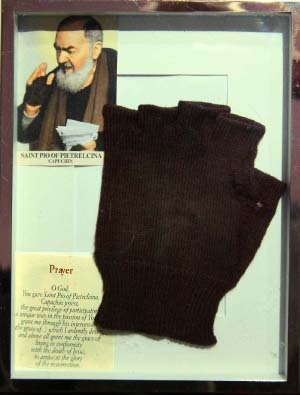 During his life, Padre Pio wore fingerless mittens to protect his wounded hands. These gloves are revered as relics by devotees of the saint, and miracles have been attributed to them. Padre Pio was made a saint by Pope John Paul in 2002. This year marks two important commemorations in the life of St Pio, the centenary of the stigmata, and the 50th anniversary of his death. Contact Betty on 045 525094 for more information about the visit.